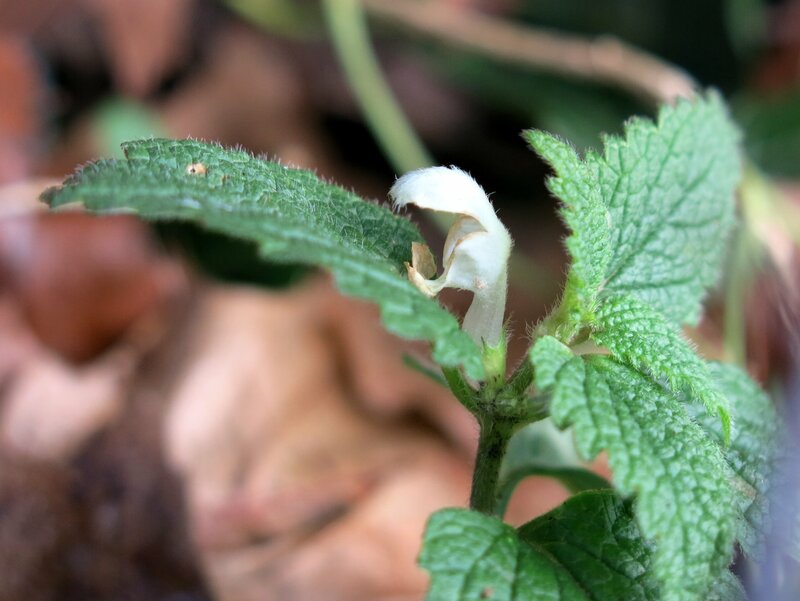 Each year, the Botanical Society of the British Isles (BSBI) run a New Year’s Plant Hunt where they invite people to record as many species in flower as they can in the New Year – between 1st and 4th January. After a few days away, and four plant hunts down, I decided to cheer up the first day back to work by carrying out a fifth and final Plant Hunt on the 4th of January, this time on home turf. Previous hunts had been in Exeter, Tyntesfield National Trust, Bristol City Centre and rather closer to home, in Stonesby Quarry and Branston just over the border in Leicestershire. I started in the dark so the first few photographs are interesting examples of headtorch botany, but the sun steadily rose and the images soon lit themselves. I walked from Harlaxton village to the A1 along a stretch of the Grantham Canal, and then into the centre of town. Having stopped the clock for a morning at work, I headed back out at lunchtime to close out the three hours allowed for a search by heading up to the Hills and Hollows at the back of the town. The whole route was around 5.5 miles and took a little under 3 hours to complete. I counted up a total of 44 species on this hunt – the most of any of the individual five hunts undertaken which perhaps shows the benifit of walking on familiar ground! The full list and a montage of all the species is provided at the end of this post but I’ll focus now on a few examples of the kinds of flowers which I encountered and the trends which seemed to appear across four days of hunting for flowers in different habitats and counties. One of the most fruitful locations seems to be cracks, crevices, edges and other overlooked places in built-up areas. Think of those splashes of green at the side of pavements, at the bottoms of walls and fences, or the edges of front gardens. Survival in locations such as these often means a quick turnaround from seed germination, to flowering, to setting seed before the opportunity vanishes. In this way, the species is maintained wherever niches arise, and persist with a constantly shifting distribution map. Such species encountered in this hunt include petty spurge, shepherd’s purse and annual meadow grass. Then there are those species which are flowering precisely when they intended to. 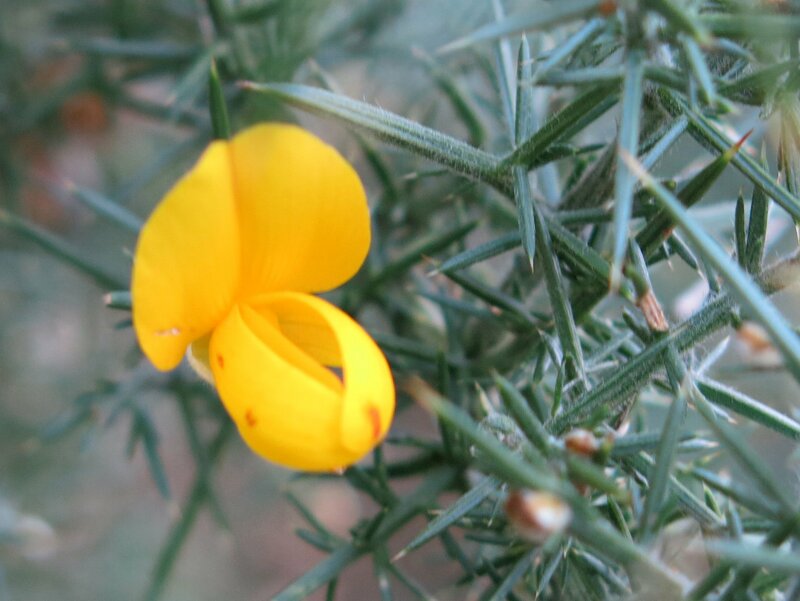 Gorse typically begins flowering on the Hills and Hollows to the east of Grantham in December and continues through into the summer although flowers can really be found at any time of the year. This gives rise to the saying ‘when gorse is out of flower, kissing is out of fashion’. Winter heliotrope is another species which is often found flowering over Christmas and into the new year – there is a colony of this growing beside the River Witham, right in the centre of town. 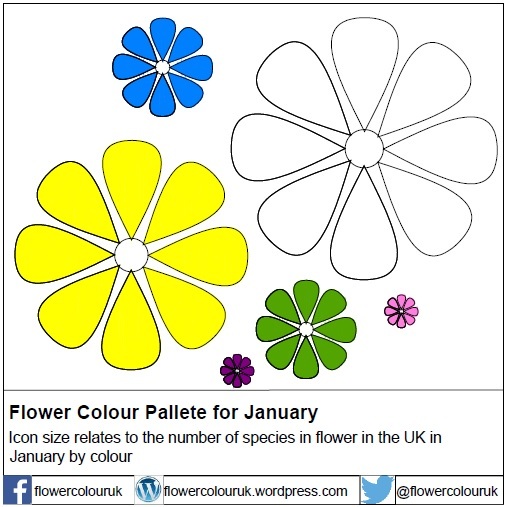 Naturalised species can also be counted in the New Year Plant Hunt – these are non-native species which are growing wild without intervention Periwinkle is a brightly-coloured example of a winter-flowering naturalised species which was growing towards the Hills and Hollows. Next are a bunch of slightly early spring species. These are those which are preparing to flower soon but have apparently been tricked into doing so a little earlier than usual by the clement conditions. Examples include shrubs – such as hazel, blackthorn, holly and dogwood – as well as some spring flowers such as primrose and lesser celandine. Another naturalised species on the list was wood spurge, a healthy self-set colony of which was flowering away at the base of a hedge towards the east of the town. These species typically flower between February and May so a January flowering is not excessively early. Another common theme I have spotted is the propensity for species to flower where the vegetation has been cut recently. This can be easily visualised where the daisies and dandelions still brighten up most lawns. Along the Grantham Canal, it was noticable that hogweed and cow parsley both flower just to the sides of the towpath where there was a late-summer/early-autumn cut but are absent further out where the sward escaped the blades. Perhaps this works a little like the Chelsea Chop technique which delays and extends the flowering period, but cutting is also a form of stress to the plants, and this can encourage them to flower and set seed as a survival response. Finally there are the long-season species – these are flowers which naturally flower late into the year. Examples include wood avens, red and white campion, white deadnettle, field speedwell and yarrow all of which were recorded flowering along the Grantham Canal towpath. The ever-delightful ivy-leaved toadflax also falls into this category flowering from May right through into the early winter – this delicate little flower grows in cracks and crevices in many of the walls throughout Grantham. The persistence of these species, especially considering there has been little frost to speak of so far this year, is broadly in-keeping with their general phenology. It’s been a good few days and a great excuse to get out and find some wildlife in the depths (although clearly not the dead) of winter. I found a total of 64 different species across five hunts in four counties! Many thanks to BSBI for organising this – the deadline for the results is the 8th January and I’m looking forward to seeing the results and analysis which will follow their collation of records from around the country. From the conversations on twitter, it appears that many people have got involved this year. If you want to get involved next year, check out the BSBI webpage and get recording when New Year’s Day comes around again! A montage of the photographs of all the species recorded on the Grantham New Year Plant Hunt is provided below, along with the complete species list.